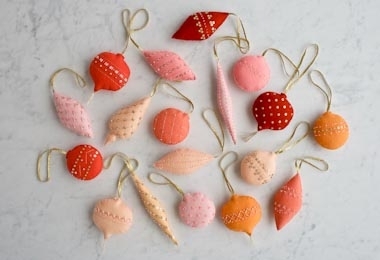 Add your own handiwork to the tree with Purl Soho's beautiful Heirloom Wool Ornaments Pattern! 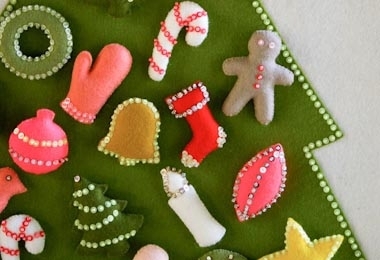 Hand sewn in soft wool felt and then decorated with embroidery stitches and sparkly sequins and beads, Heirloom Wool Ornaments add a playful, festive, and very special flair to the season. Our full-color Heirloom Wool Ornaments Pattern walks you through every step of making your own set of 24 Ornaments and is available as a PDF download or a hard copy. 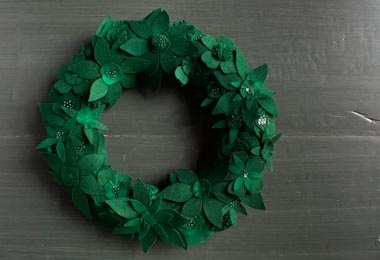 For a list of materials you'll need to make your Heirloom Wool Ornaments, please click Product Details, above. Eight 8 x 12–inch pieces of wool felt. We used a Purl Soho Wool Felt Bundle in Lusterware, Milk Glass, or Wineberry. Another option: All of these materials, including the Pattern, come in our Heirloom Wool Ornaments Kit. Additionally, you can purchase the beads and sequins together in our Beads + Sequins for Purl Soho's Heirloom Wool Ornaments Pattern Kit.